With Elorus you have the ability to record and bill the time you spent on various tasks on behalf of your customers. You can also use the time tracking feature for internal use to track the time required for specific tasks and to better price your own and your partners' time! The first step to organizing your time is to create one or more projects according to your needs. > The ability to create new projects have users with the role of administrator and users with sufficient permissions in Time tracking. > Users with limited contact access can only view and create projects for contacts they have access to. From the Time tracking menu, click Projects and then Add. There, you are required to name the project, connect it to a customer, and designate its billing method and rate. Name: An indicative name for the project, for example, "site construction". Description: A brief analysis of the individual project components. Client: You select from the list the client for whom you have the project done. Client portal (optional): You may let the client review this project and monitor the tracked hours via the client portal. Applies only to clients with enabled client portal access. From this field you can choose to show all time entries, show only the billable ones or hide the project from the client portal altogether. Fixed cost: Irrespective of the length of time, the customer will be charged an X amount. Hourly rate: Charge an amount for each hour spent on the project. Task hourly rate: Fee for each hour spent on individual project tasks (this amount is stated when creating the job. Assignee hourly rate: Billing per hour when one of the users is working on a project. Non billable: You can also not bill the project, in case this is an internal process you just want to monitor. > If you select one of the hourly rate option you can type the preferred amount on the Hourly rate field. By clicking Save, the project is created and you are ready to start tracking the hours you and your team spend on it! If your project is broken into smaller tasks which you want to keep track of separately and then bill them, you need to create those tasks first and define their rates. For detailed instructions visit the related article here. > It's not mandatory to have specific tasks for a project in order to be able to time track your work. In fact, tasks can have general descriptions and charges so you can use them for multiple projects. If you want to modify a project, you can do it from its view page and the Edit button. 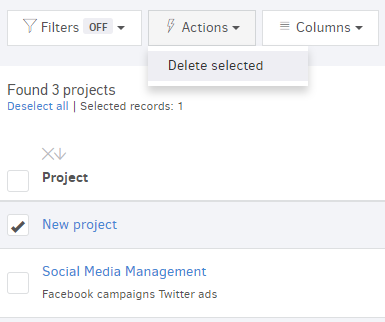 From the list of projects select the desired one, check the box, and then click Actions -> Delete Selected. You can also delete a project from its view page if you click Edit. At the bottom of the editing page you will find the Delete button. Can I delete a project with registered time entries? No, in order to delete a project it should not be associated with time entries. Therefore, you need to delete these time entries first and then the project itself. Can I delete a invoiced project? 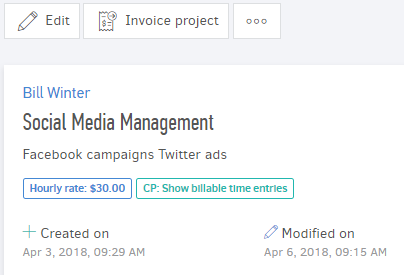 No, in order to delete an invoiced project, it should not be associated with an invoice. Therefore, the related document should be deleted first, then any associated time entries and then the project itself. Can I edit an ongoing project? Which fields? Yes, you can edit all the fields of a non-invoiced project.